Build a custom PocketMod template by choosing a module for each page of the template below. (A preview will show when you select one.) Or, try one of the "Quick Pick" options to automatically populate the template. Click "Publish Your Custom PocketMod Template" to create the output. Publish Options: PDF Document PNG Image Open the document Save the document 1 page 2 pages The open/save and number of pages options only apply to PDF output. Double-sided: Choose 2 pages above to more easily print the template on both sides of the page. 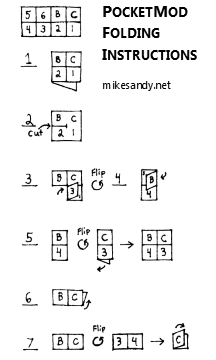 (When printing, make sure to choose the option to "flip pages up", "flip sheets on the long edge", or similar.) When one side is full, simply unfold the PocketMod and then re-fold it in reverse to double its capacity. Printing Tip (for PDFs): Print the actual size. Do not scale the page to fit in the printable area (e.g., "Fit", "Shrink to Printable Area", etc.). The margins built into the templates should be large enough to print the template properly without cutting off anything important. A PocketMod is an eight-page booklet (six pages plus front and back covers) made of one folded sheet of paper that fits in a shirt pocket. I did not invent PocketMods and I did not come up with the idea to offer customizable PocketMod templates. Visit the original PocketMod creator's website at http://www.pocketmod.com. I'm not even the first to extend the original PocketMod idea (see re:PocketMod). With all that said, soon after I started using PocketMods I began creating custom templates for myself. I created this site because I wanted a way to share my templates while also allowing users to customize the templates. I hope you find the templates useful and of high-quality. And definitely check out the other PocketMod websites. They offer some features that I do not (such as customizing the modules themselves). Thank you for visiting my site. A PocketMod is an 8-page (six pages plus front and back covers) booklet made of one folded sheet of paper that fits in a shirt pocket. Taking notes, compiling lists, and organizing ideas and information with a PocketMod is more efficient than using random scraps of paper and more portable than using notebooks. Sometimes typing with your thumbs on a touchscreen is not the most efficient way to record certain thoughts, notes, ideas, etc. There are lists, notes, etc. that simply do not require an indelible presence in the cloud or on your electronic devices. Do you really want a reminder to "clean the gutters this weekend" taking up space on your smartphone? Have you ever tried drawing a diagram on your smartphone with your finger or a stylus? How did that turn out? Drawing diagrams on paper is usually much easier. Personal reason: One way I use PocketMods is to plan and organize travel. When I travel for leisure, I like to disconnect from my electronic devices as much as possible, so I plan the trips on paper. I record things to do, itinerary ideas, confirmation numbers, etc. in my travel PocketMods and refer to them throughout my trips. The leftover notes also serve as a cool souvenir to look back on after your trip. Do I need to use special paper? No. In fact, I prefer to use cheaper 20-pound copy/printer paper with brightness less than 90. Cheaper paper folds more easily and it seems to accept ink a little better because it has less sheen. Flip the page over and fold the sheet of paper in half. Cut along the line until you reach the crossing line halfway through the page. 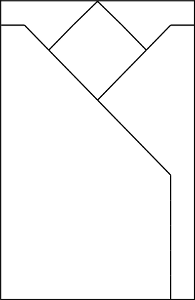 Fold the section below the cut line (if viewing the page with the front cover at the top right) to the edge of the page. Flip the page over and fold the remaining loose section to the edge. Flip the page over and unfold so that the page opens to show four sections. Fold the page in half vertically by folding the bottom two sections (pages 4 and 3) behind the top two sections. Flip the page over so pages 3 and 4 are facing you. Fold the booklet in half. Done. Why are the modules on the bottom row of the page upside down? Pages 1–4 on the bottom row need to print upside down so that your folded PocketMod will have pages that are all right-side up. What do you mean by "variable" for some of the list modules? "Variable" means you can use more than one line for a list item, if needed. Write your single or multiple line entry and then outline only the checkbox next to where that entry begins. The non-outlined checkboxes are light enough on the page that you won't even notice them when you have a full page of list items with only the important checkboxes outlined. Note: The golf scorecards also have this feature for the "Fairway" row because they won't apply to par 3 golf holes. So, outline only the checkboxes for holes that are greater than par 3 (and hopefully put checkmarks in each of the boxes when you hit your drives on the fairways). Any suggestions on writing utensils? If I'm using a PocketMod for general note-taking, then I typically use a ballpoint pen. Ballpoint pens are ubiquitous, and the ink rarely leaks, smudges or bleeds through. For some situations, however, I have found that erasable pen is best. For example, when planning trips, I find it necessary to occasionally edit my notes. I prefer erasable pen over pencil because the ink is more vibrant than pencil, it erases more cleanly, and the ink does not smudge. Specifically, I recommend Pilot FriXion erasable pens. My favorite is the Pilot FriXion Slim 0.38mm. Print templates on both sides of the page. 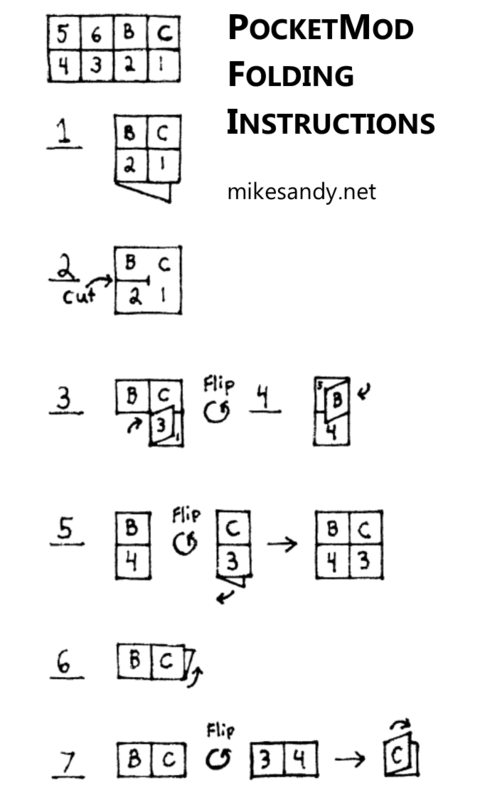 (Make sure to choose the option to "flip pages up", "flip sheets on the long edge", or similar, when printing.) When you're finished with the first side of the page, unfold it and then re-fold it in reverse to double its capacity. Behind page 4 and behind the front cover page there are "pouches" created by the folds for storing business cards, etc. You can also store a business card or two in those folds just to provide some rigidity to your PocketMod so it doesn't get crumpled in a purse or pocket. Unfold your PocketMods to scan and digitally file your notes. It's a pocket for your PocketMods made out of one sheet of folded 8.5" x 11" paper. It protects your PocketMods from getting crumpled in a purse or pocket. It keeps your PocketMods together in one place. Terms of Service: This service is offered as-is with no warranty or guarantee.